PLYMOUTH Studio School students Tate Budge and Rhys Roffe scooped four gold medals and a silver between them at the recent UK International Taekwondo Federation (ITF) Championships in Crawley. Year 10 Roffey, who trains with Plymouth South Coast Martial Arts, put up a hard-fight to retain his national title in the under-16s sparring. He also took silver in same age group patterns event. Roffey, who was selected to train with UK ITF Team UK at the age of 12, is the English, National and UK champion in the under 16s sparring. At this year’s ITF World Championships in Brighton, he also took bronze in the under-18s sparring, despite being only 14-years-old. 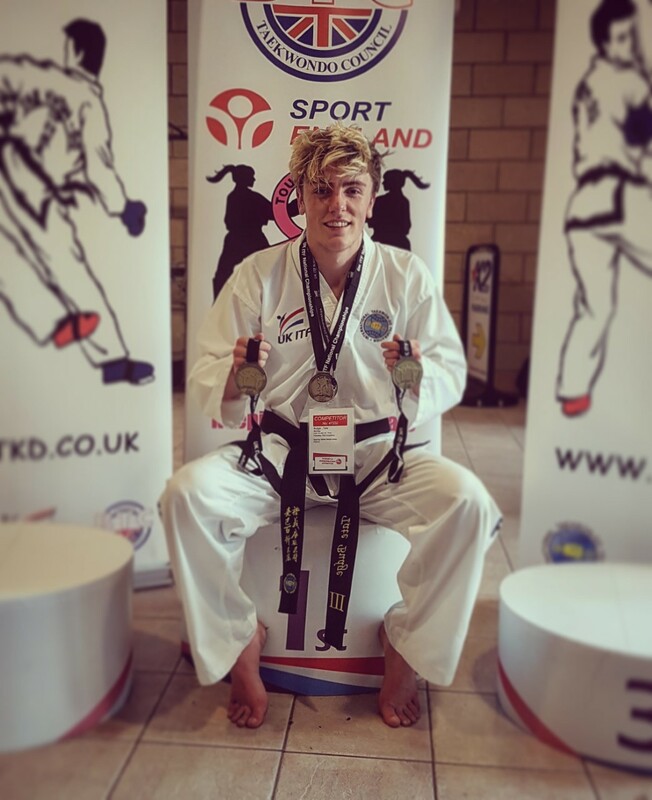 Year 13 student Budge, who trains with Brit Spirit Martial Arts in Tavistock, Richards TKD in St Austell and the Trenic Taekwondo Academy in London, came away with national titles in the under-18s 3rd degree black belt patterns and the 65 kg sparring. The 17-year-old also took gold in the adult (18-35 years) 3rd degree black belt patterns. Budge’s success follows his second world title win at the ITF World Championships in July and he is now preparing for the World Championships in Argentina in 2018. Both youngsters were recently selected to attend the Olympic team assessment programme for the 2020 and 2024 Olympics. Head of sports performance at Plymouth Studio School, Jon Rhodes said: “We’re incredibly proud of Tate and Rhys and their recent achievements. Plymouth Studio School opened in 2015 on-site at the University of St Mark & St John, providing a combination of education, sports development and sports careers for 14-19 year olds. Students are due to move into a new £4.2 million school building, including a high performance sports zone with the latest in monitoring and research equipment, on November 7.